At some point, I had to do a number of hard resets within a few days, which resulted in me deleting the same files, over and over again, in order to save space. In the end I decided to automate the process a bit and this is the result. It has two modes of operation, simple and Advanced (scripted). 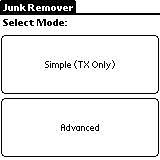 Simple mode will only work on a TX. It will automatically remove most junk files from a stock ROM. A list of the files that are removed can be found here. The advanced mode works for any PalmOS device, for as long as it supports an external card or has an internal drive. By writing a script (the format of which can be found here), files can be removed from the device's internal memory and/or external cards. For safety reasons, wildcards and recursions are not supported. The simple mode of this application should/will only work on a TX. If for some reason you have a TX and it quits with an error message after you run it, let me know. The advanced mode (which uses scripts) will work on any palm PDA with an expansion card. For best results, run this application before you run anything else on your PDA. Be careful of what you select, as applications like Addit and the Welcome Tutorial do not have an installer, and you'll have to manually restore them from your archived folder in your palm desktop directory (and only if you've hotsynced with them on the PDA before). Similarly, the T-Mobile hotspot files might be needed if you are using that service. v0.2: Added support for international overlays. Can now delete the T-Mobile Offer directory and its contents. I am not responsible for any damage this software inflicts on your data or device. Use at your own risk.